Nuts are a very expensive ingredient in the baking industry and must be handled with care. Bakers require knowledge and understanding of how to use them in recipes and the potential hazards due to allergies. Awareness of cross-contamination is important, as food that should not contain the allergen could become dangerous to eat for those who are allergic. Allergies are severe adverse reactions that occur when the body’s immune system overreacts to a particular allergen. When someone comes in contact with an allergen, the symptoms of a reaction may develop quickly and rapidly progress from mild to severe. In Canada, peanuts and tree nuts (almonds, Brazil nuts, cashews, hazelnuts, macadamia nuts, pecans, pine nuts, pistachio nuts, and walnuts) fall into the category of the priority food allergens. Note that peanuts are not true nuts; they are from the legume family. However, in some cases people with a tree nut allergy also react to peanuts. Coconut and nutmeg are not considered tree nuts for the purpose of food allergen labelling in Canada and are not usually restricted from the diet of someone allergic to tree nuts. Coconut is a seed of a fruit and nutmeg is obtained from the seeds of a tropical tree. However, some people react to coconut and nutmeg. People with tree nut allergies should consult their doctor or allergist before trying coconut or nutmeg products. Due to the severity of nut allergies, any product containing nuts, or that may have come in contact with nuts, should be identified in the bakery, on the package, and on the menu. 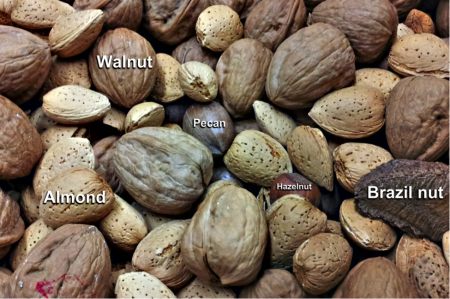 The more common types of nuts that are used in the bake shop are listed below. Coconut is the fruit of the coconut palm, consisting of a thick, fibrous brown oval husk under which there is a thin, hard shell enclosing a layer of edible white meat. Ninety-five percent of all commercial coconut grown comes from the Philippines and Sri Lanka. After harvesting, coconuts are shelled, pared, and the white pure coconut meat is washed and pasteurized. The coconut meat is then fed into the shredder. Because of the many uses for the finished product, the meat is cut in different sizes using appropriate cutting heads. Some of these cuts are coarse, medium, macaroon, and extra fine for granulated cuts, and flake, chip, and thread for fancy cuts. In baking, they are used in cookies, coloured for decorations, and roasted for coating cakes. 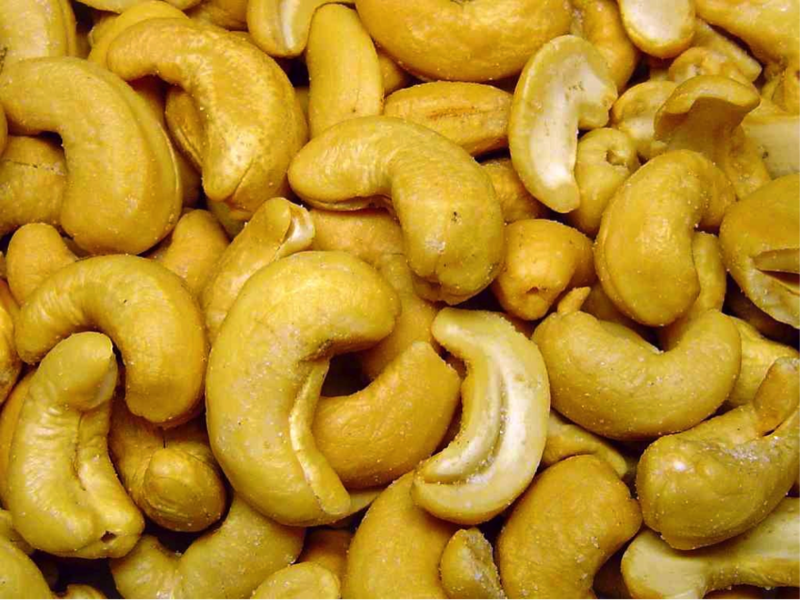 Cashews are kidney-shaped nuts that come from a tropical evergreen tree. In baking they are used whole or broken in fruitcakes or sliced and roasted on cakes and fancy pastries. Walnuts come from a tree native to the temperate parts of the northern hemisphere. 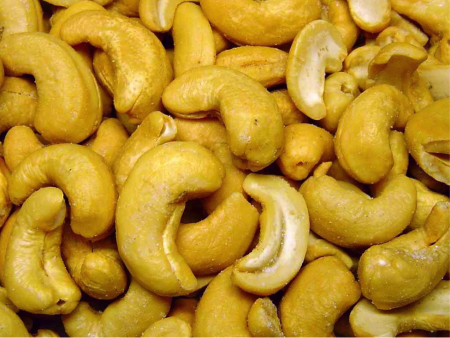 They are one of the most widely used nuts in baking, mainly because of their cost. They are halved to serve as decorations on fancy cakes, broken in fruit cakes, or flaked and roasted on the sides of butter cream cakes and fancy pastries. Hazelnuts, also called filberts, are the edible nuts of the cultivated European hazel tree, a member of the birch family. They are used for decorations on cakes and pastries, in nougat and praline paste, ground in macaroon-type cookies, or flaked and roasted on the sides of cakes and French pastries. 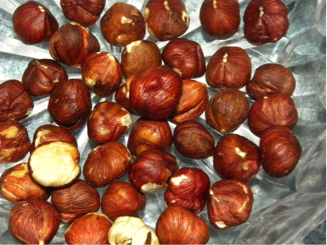 Hazelnuts are the only commercially produced nut in British Columbia. Almonds are nut-like kernels of the small, dry, peach-like fruit of a tree growing in warm regions. Producing countries are Italy, France, Morocco, United States, Portugal, and Australia. 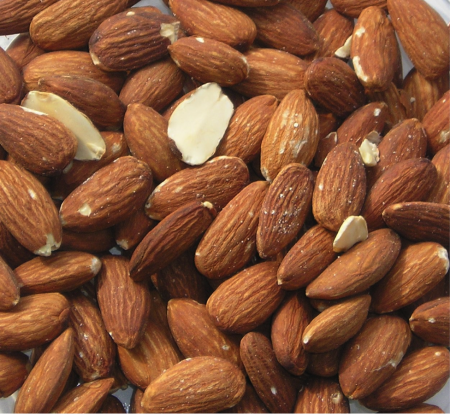 There are two distinct types of almonds: the sweet and the bitter almond. The former are the well-known edible almonds of the world’s market. Sweet almonds are eaten as nuts, or used in confectionery. Like hazlenuts, they are used ground as ingredients, flaked and roasted for decoration, and in paste form. The kernel of the bitter almond is as inedible as peach kernels. When freed from prussic acid, the oil of bitter almond is used in the manufacture of flavouring extracts. Almonds contain about 45% to 50% of a fixed oil. Peanuts grow in brittle pods, ripening underground and containing one to three edible seeds. Ground or flaked, they are used roasted on the sides of cakes and pastries and as peanut butter in cookies. 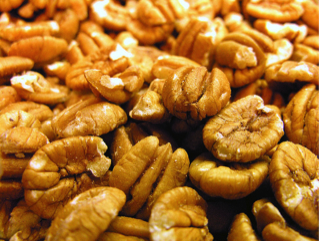 Pecans come from a North American tree of the walnut family. The edible nut is in a thin, smooth, olive-shaped shell. Fancy halves are used for decorations on cakes and on fruitcakes, or broken in Christmas cake, in pecan rolls made with sweet dough, and in tarts and pies. 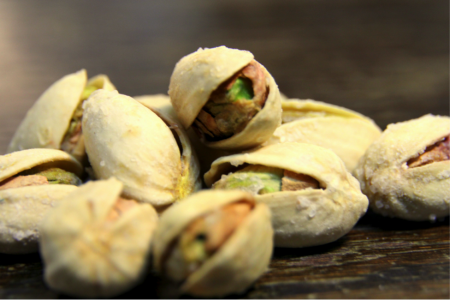 Pistachios are the yellow-green seeds from the nut of the pistachio tree, a small tree of the cashew family. This precious nut is mostly used for decorations on fancy cakes and French pastries and for flavouring butter creams and ice creams. 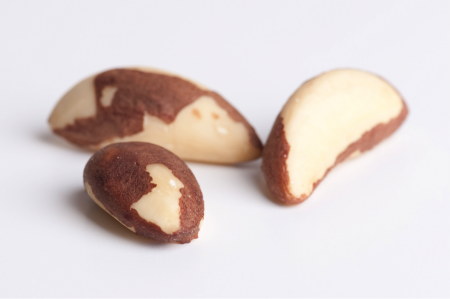 Brazil nuts are hard-shelled, three-sided, oily, edible seeds of a South American tree. They grow in clusters, like segments of an orange, in large, round, hard-shelled fruits. In baking they are used whole in fruitcakes, or flaked and roasted on cakes and pastries. 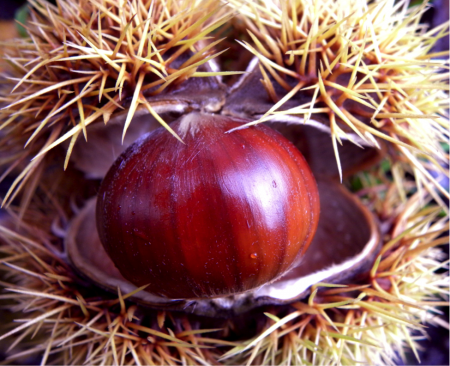 Chestnuts are also called maroons. They are not to be confused with the ornamental horse chestnut, which is a different tree. The best quality chestnuts come from Italy and Spain. They are used mainly in ice cream desserts and cooking. Candied sweet chestnuts are called marrons glacés. Nuts and Nut-like Ingredients by go2HR is licensed under a Creative Commons Attribution 4.0 International License, except where otherwise noted.